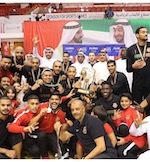 Ahmed Marie had announced his resignation as a head coach of alexandria sporing club after several years of success and agreed terms to lead Ahli Dubai in the new season. The Egyptian coach who had helped Alexandria sporting clubs to achieve several tittles on both local and international field had announced the end of his journey to start new chanllenge in UAE with Ahli Dubai. Ahmed Marie is the father of Egyptian player Assem Marie and one of top Egyptian coaches as he had noteable achievments with Gezira and Sporting clubs in addition to Egyptian national teams.